- Voice Mode : Poly, max 2 notes at a time. 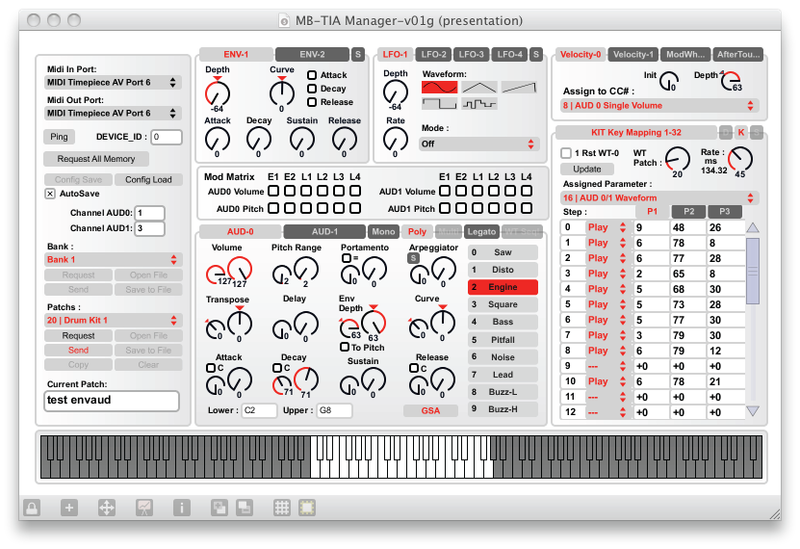 - Wavetable Mode : Kit, one note / one sound. Only one MIDI track, five differents sounds, for this drum pattern. The track starts with this five sounds. Next part: MB-TIA Cartridge. Final PCB. Next entry MB-TIA Cartridge. PCB Drawn. Wow, very impressed! Count me as interested in a build of my own. Are you aware of little-scale's work? Perhaps you could look into adding sample playback abilities. :smile: Keep up the awesome work! I wasn't aware of little-scale's work, thank you, is it your work? What's the A26F interface? Does it work with synthcard? Maybe You Can help me. I am looking for someone who has already identified sounds and their codes (AUDF / AUDC), to complete Patchs and Banks. I'm looking for a typical melody for box startup, a MIDI file + code(AUDF/AUDC) for each note used in sequence, length from 1 to 3s. Perhaps you could look into adding sample playback abilities. Do you know of a place that sells TIA chips, or do they have to be "picked"
PCB which fits in cartridge is drawn but i need time for print one and test it before propose a batch.